Here’s all you need to know about our festival within a festival! This year we are back at the heart of the River Carnival action next door to the Music Pool Tent. 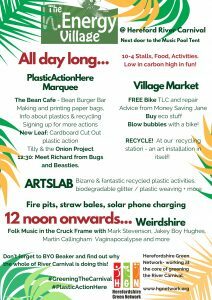 The h.Energy Village is a collaboration between Herefordshire Green Network, New Leaf and Hereford College of Art, along with HGN’s own Plastic Action Here team..
All day long you will find… great activities that are low in carbon and high in fun! Have a look at the image or scroll down for more info and links. There is still time to sign up to help! Join the Big River Clean Up on Saturday 28th April, 11am – 1pm. Be part of our Plastic Action Here team – join activities in the Art Lab & the #PlasticActionHere Marquee, customise #PAH! paper bags for Carnival stall holders & the Left Bank Etsy Market, & sign people up for Plastic Action Herefordshire after the Carnival..
ARTS LAB– bizarre & fantastic recycled plastic activities: life-drawing classes with plastic models… storytelling from a scaffolding bed… plastic weaving and magnetic art… biodegradable glitter wrestling & face-painting from Fairy Love, plastic sculpture seating.. and much more. The Plastic Action Here team! Making and printing paper bags to give away, signing people up to local single use plastic action, and full of good advice and information about plastics & recycling… come and join in..
…And at 12.30 come and meet Richard Fishbourne of Bugs & Beasties and the Hereford Yazor Brook Restoration Project. Richard will talk about the essential part our local waterways play in the environmental health of the city, and the impact on habitats of plastic pollution. Plus our own One&Only recycling station– with Recycling Angels to offer recycling advice. Charge your phone with the help of Solar Kinetics. With critically acclaimed folk musicians, including Mark Stevenson, Jakey Boy Hughes, Martin Callingham and the infamous Vaginapocalypse.